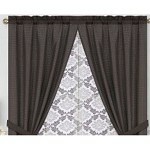 Mainstays Anderson 6 Piece Curtain Panel Set, Brown, 27" x 84"
This Mainstays Anderson 6 Piece Curtain set will make you look like a decorater! Simply complete the room by hanging the 6 piece set all on one rod. 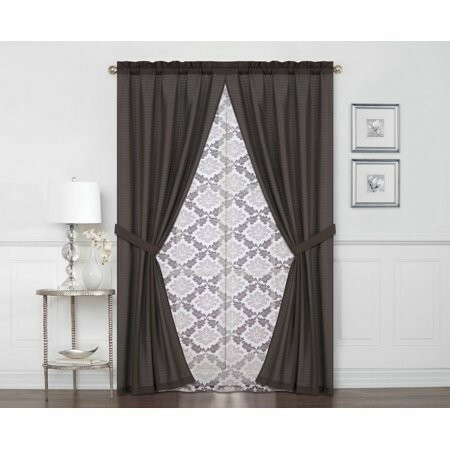 The curtain set has 2 pretty sheer panels, 2 solid panels and 2 coordinating tie backs. Each panel filters light while creating privacy in the room. The Mainstays Anderson Curtain set is machine washable for easy care so your room will always look up to par!